Verizon Ad Offers Free BlackBerry Curve ... Running Palm OS? I always crack up when I see things like this. 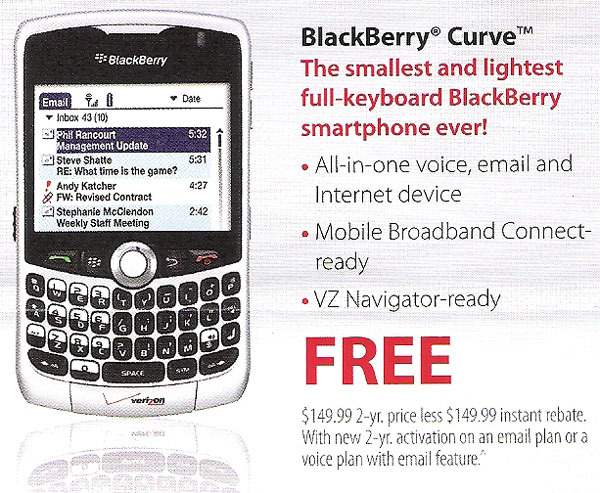 Lila sent in this ad from Verizon offering a free BlackBerry Curve, the only issue is that the Curve is running Palm OS. We've seen this a few times in the past, there was a messed up Radio Shack ad that showed WinMo running on a BlackBerry, and this one that had the BlackBerry OS running on a Nokia E71. You really think someone would catch these before they went to print. Thanks Lila for sending this in!